If you do this right, you’ll quickly be known as a source for creative problem solving, and your reputation in the market will skyrocket. Everyone needs someone to go when they have a problem. But before we get to that awesomeness, we need to breakdown just what problems we’re talking about. After all, you can’t do everything under the sun and impossible tasks may be off the chart immediately. There are some customer’s problems that we don’t want anything to do with, ever. So let’s take a step back and look at Solutions Based Selling, and then outline how it might work for you. To dig into the process let’s start with the idea that you need to completely understand your potential customer. You can do this by defining your best customers, as I outlined in this article last week. Use the 80/20 rule, and identify specifically who are your best customers. Then take a look at how they do business with you. Order size, frequency, decoration method, the complexity of their orders…everything. Jot down anything that looks like a trend. These are easier to clone for new customers as you have a better understanding of this group. Does this limit potential customers that are dissimilar? But if you want to market to a different group, you are going to need to do some research to understand them better. People normally don’t buy with metrics and data in mind. They buy on emotion. Alignment. Shared experiences or language. Some sort of connection. The trust that you want to deliver to your customers is built when they can see a match with what you have already achieved or offer. For example, let’s say you are having a problem with your car. It’s not running right and you need to get it serviced. How are you making that decision? Usually, it is with a set of examples that lead us to believe that the shop we take our car to will be fixed correctly and at a price, we are willing to pay. That defines our “Why”. You simply need to understand their “Why” and offer examples of that solution for them to understand that you are the best match. But you have to make it easy for them to understand. For example, let’s say you have invested in a DTG printer. Many shops have. But, is that piece of equipment running constantly in production with orders? It’s because you are marketing the wrong problem. Nobody is online or searching for digital printing. Yet, I’ll bet plenty of folks are out there looking for “Same Day” or “Next Day” printing. You just have to understand how to market the solution you are offering the right way. The story you need to be telling the solution to your potential customers biggest problem. How the decorated apparel industry works is a mystery to most of our customers. They can’t come as prepared as we would like them to be as they just don’t have the experience and language to describe what they need. One of your main jobs at the beginning of any sales relationship is going to be to educate your customers and dig into what their pain point is that you can solve. Great questions will produce a great solution. What is their biggest worry or fear? Name the pain. Get your potential customer to identify what is their biggest problem or fear. Simply ask them. This immediately sets the stage for you. If there is more than one challenge, get them to prioritize them. Rate the earthquake. You have to make it relative to their business. Scientists rate earthquakes so everyone can comprehend the magnitude of the situation. You need to do the same. Not necessarily with a rating scale, but what you want to find out is how big the problem is, and what would happen to them if it instantly went away. What would change for the better? Would their financial situation improve? Maybe there is a significant time saving with your potential solution? These types of conversations flesh out these pain points. By understanding their story you can grasp the pain points that can help you build the right solution to their challenge. This is entirely different than the rookie mistake of simply diving headfirst into quoting. Stop selling ink on cotton. That’s not your value. Any goofball can throw out a quote and print on some shirts. Big deal. Your value is rooting out their biggest fear, their ultimate challenge, their looming problem…and divining a solution that will work. Problem solvers built trust quickly because they make things easier. So, can you articulate that? What expertise do you have that others may not possess? This could be creative talent, years in the industry, or some special training or certification you’ve received. How are you making your experience easier and frictionless for your customer? What steps have you eliminated in your process for them to make it more convenient to order from you? Do you save them time? Outline what they could be doing with their time instead. What about money? When working with you are they saving money in any way? What could they be doing with all of that cash? Do you make them money? Maybe they are reselling your work. Prove your worth. Does your customer get any extra status by buying your work? For example, a streetwear brand may promote community or affiliation in their marketing. One day this week someone is going to call or walk into your shop with the worst order ever. This is a job that you have zero business taking. Resist the urge to say yes. It’s totally ok to either say no or reframe what you can do so the customer understands. This skill is just as important as solving problems as it protects your schedule and company from jobs that you won’t make money on. While the chances of them hitting it big are fairly slim, you can pull two types of ninja moves here. The first is to redirect them to your competitor down the street “who specializes in this work”. Let them lose money on that job. The second is to hand over a prepared rate sheet for how you work, your minimums, and what they need to do to get started. Sure, they only want six shirts…but your minimum is 48 per design. Bonus: Accept the order and print them using a DTG printer. Price this to make money. 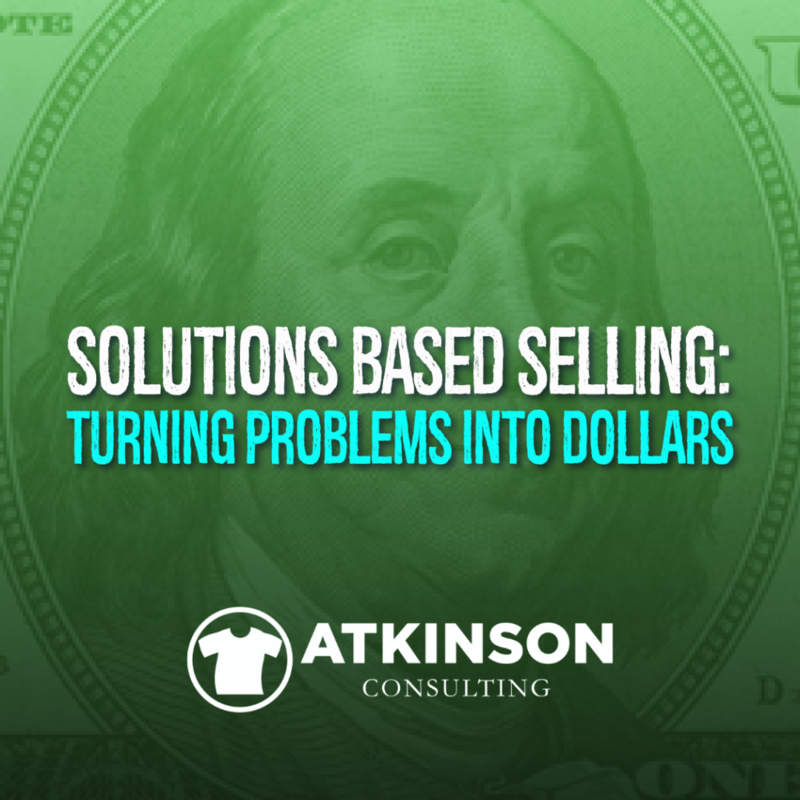 For solutions based selling to work, you have to want to offer the solution. Some challenges should be avoided like a pothole in the street. Just swerve around it on your way to make more money down the road. One of the ways shops lose their way is with how they construct their pricing. Often it is built on surveying the competition. While this might get you some numbers to use for quoting, the math might be wrong and you aren’t making as much money as you should. Price for Profit was written to help shops easily understand a way to use their own math to build a price list that works. Your efficiency and costs are used as the foundation for the list. I’ve set it up with easy to use tools. 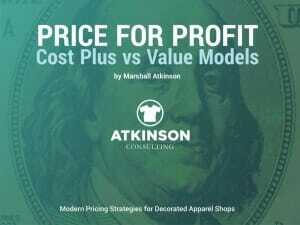 Rethink how you are handling pricing in your shop.